Shirts With Random Triangles: Four-star cornerback prospect Rico McGraw flips to Alabama from Georgia. Four-star cornerback prospect Rico McGraw flips to Alabama from Georgia. Rico McGraw. Photo via al.com. 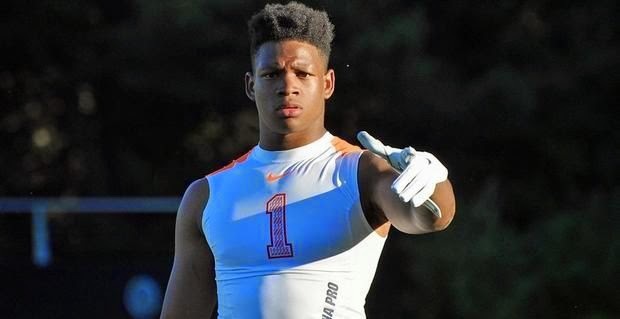 From the "What's mine is mine, what's yours is mine" department comes word that a member of Georgia's 2015 recruiting class has flipped his commitment to Alabama. Nashville, TN high school senior cornerback Rico McGraw flipped to Alabama on Thursday. According to 247Sports.com , McGraw is a four-star rated CB ranked at no. 142 in the recruiting site's composite national rankings for 2015 prospects. He is ranked at no. 14 among 2015 CB prospects, and ranked at no. 4 among 2015 prospects in the state of Tennessee. McGraw is ranked at no. 155 in the ESPN300. McGraw attends The Ensworth School in Nashville, Tn. He stands six ft., and weighs 190 pounds.